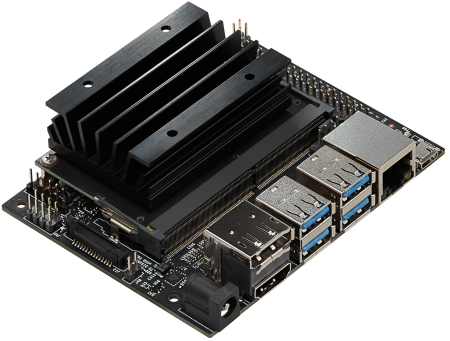 NVIDIA Jetson Nano is an embedded system-on-module (SoM) and developer kit from the NVIDIA Jetson family, including an integrated 128-core Maxwell GPU, quad-core ARM A57 64-bit CPU, 4GB LPDDR4 memory, along with support for MIPI CSI-2 and PCIe Gen2 high-speed I/O. 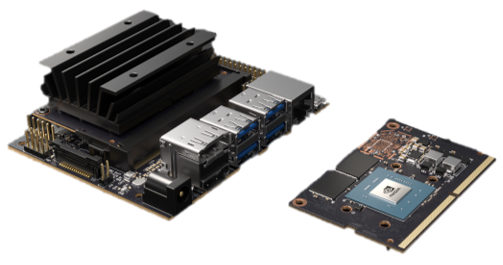 Useful for deploying computer vision and deep learning, Jetson Nano runs Linux and provides 472 GFLOPS of FP16 compute performance with 5-10W of power consumption. Jetson Nano is currently available as the Jetson Nano Developer Kit for $99, with the production compute module coming in June 2019. See the wiki of the other Jetson's here. The Jetson Nano Developer Kit is an easy way to get started using Jetson Nano, including the module, carrier board, and software. It costs $99 and is available from distributors worldwide. See Power Supply Considerations for more information. Follow the Getting Started with Jetson Nano Guide to setup your devkit and format the MicroSD card. Plug in an HDMI display into Jetson, attach a USB keyboard & mouse, and apply power to boot it up. Visit the Embedded Developer Zone and Jetson Nano Developer Forum to access the latest documentation & downloads. For the full list, refer to the Region Selector. This section contains recipes for following along on Jetson Nano. See the NVIDIA AI-IoT GitHub for other coding resources on deploying AI and deep learning. The following are 3rd-party accessories, peripherals, and cameras available for Jetson Nano. See the Power Supply section for more information about selecting proper power adapters. See the Jetson Nano Supported Components List for devices that have been qualified by NVIDIA to work with Jetson Nano. If you have a technical question or bug report, please visit the Jetson Nano Developer Forum and search or start a new topic. See the official Support page on Embedded Developer Zone for warranty and RMA information.